For the ashes of his fathers, and the temples of his gods? Grant Gerber, who died on October 24 in Elko, Nevada while surrounded by his family, was a casualty of war. The 72-year-old, who served as a military intelligence specialist with the Army Special Forces in Vietnam, did not succumb to an ancient injury suffered in combat with the Viet Cong. His wounds were inflicted in early October during a peaceful counter-offensive against an immeasurably more powerful collectivist enemy – the U.S. federal government. In the fashion of many combat veterans, Gerber died as the result of a battlefield accident. He was an organizer of the “Grass March Cowboy Express,” a 2,800-mile horseback expedition intended to draw attention to the plight of western landowners, and to petition the government for relief. His fatal injuries occurred in Kansas when the horse he was riding stumbled in a prairie dog’s den and rolled on top of him. Although Gerber's death was not the result of a specific act of violence, it was nonetheless sustained in combat with an implacable enemy that – unlike the Viet Cong – is actually imposing communism on the home he held dear. Communism, as Marx's Manifesto helpfully explained, is “the abolition of private property,” an objective toward which federal bureaucracies have made considerable progress. In defiance of the U.S. Constitution and in harmony with the Communist Manifesto, the federal government is, by a considerable margin, the largest landowner in the United States. In each of the western states, Leviathan owns the majority of the available acreage. The Feds have possession of nearly ninety percent of the land in Nevada, which was obtained through an aggressive war with Mexico and steady expropriation of the Western Shoshone Indians. That pilfered property is administered by the Forest Service and Bureau of Land Management, which are systematically strangling what remains of the ranching industry. Similar policies have devastated the mining and logging industries, in Nevada and throughout the region. Gerber, a personal injury attorney who was elected to the Elko County Commission in 2012, clung tenaciously to the earnest but mistaken belief that the U.S. Constitution protects private property and restrains government power. He spent decades of his life fighting to restore the constitutional balance between the states and Washington. His model was colonial organizer and agitator Samuel Adams, who, like Gerber had been employed by the tax-extracting sector before repenting and lending his talents to the cause of individual liberty. Prior to 1976, the federal Leviathan recognized – albeit grudgingly – the authority of county governments to manage “federal” lands. The successor to King George’s distant, tyrannical government decided to celebrate America’s Bicentennial by enacting the Federal Land Policy and Management Act (PLPMA), which ended the pretense of actual federalism by announcing perpetual ownership of those lands by Washington. That same measure turned the BLM into a fully realized police force – a fact memorably displayed earlier this year in the agency’s paramilitary assault on Nevada rancher Cliven Bundy, his family, and their supporters. Rather than submitting with expected docility to Washington’s land grab, western property owners – and, to their credit, many elected county officials – organized a revolt that came to be known as the “Sagebrush Rebellion.” Grant Gerber was among the first to enlist, and he quickly distinguished himself among his fellow rebels. Although both objectives are laudable, the Rebels seek only to restore the status quo ante 1976, when local lands were administered by county governments, rather than being occupied and controlled by federal usurpers. 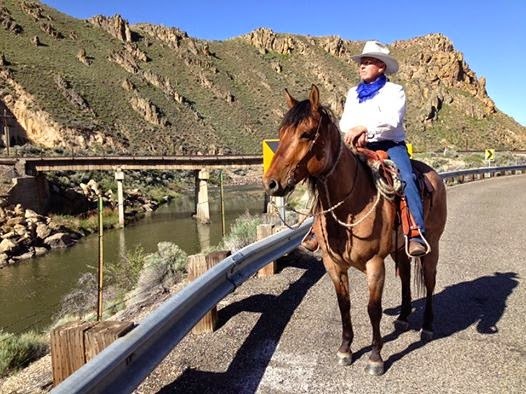 Since the revolt began in 1979, the rebels have been fighting – through litigation and public activism -- a desperate rearguard action against the Feds as they remorselessly drive ranchers and other producers off the land and close it down to public use. In the mid-1990s, Bill Clinton issued a decree banning new road construction on 43 million acres of federally-occupied land with the objective of designating up to 60 million acres as “roadless.” What this means, in practice, is that the land would remain inaccessible until it could be sold or leased to a suitable, politically favored set of corporate interests. Shortly after Clinton signed the executive order, the U.S. Forest Service announced that it would not repair a washed-out road near Jarbidge, a town of 14 people in Elko County. This decision was supposedly taken to protect the habitat of an unremarkable fish called the Dolly Varden or “bull trout.” In substance, however, it was a way for the USFS to assert dominion over lands within Elko County. As Aristotle observed, when something is owned by everybody, it is equally neglected by all alike. Since the USFS, acting in the name of the collective “American people,” refused to fix the road, the Elko County Commission dispatched a crew to carry out the required maintenance. USFS regional commissarina Gloria Flora obtained a restraining order to prevent repairs from proceeding. 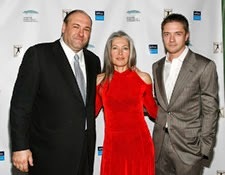 The Red lady in red: Flora at a Hollywood eco-fundraiser. Denied any other means of redress as the unaccountable USFS proceeded to lock up local lands, the Elko County Commission urged local residents "to let the Forest Service know what you think about this by not cooperating with them. Don't sell goods or services to them until they come to their senses." What this meant, of course, is that local merchants willing to forego potential profit in exchange for making a political statement in the service of their values freed up economic opportunities for others in Elko. Plumbing the language of self-pity, Flora depicted herself and her khaki-clad chekists as victims of “discrimination,” and she demanded a congressional investigation of what she called “irresponsible Fed-bashing” in Elko County. When Congress reacted by scheduling on-site hearings to be led by the late Idaho Rep. Helen Chenoweth, Flora – prefiguring the conduct of a similarly petulant administrator, Lois Lerner, the former head of the IRS’s exempt organizations unit – denounced what she called a “public inquisition of federal employees,” and resigned. 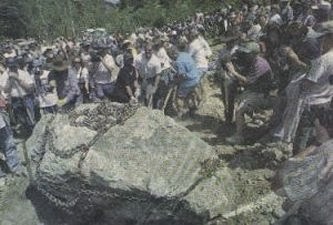 On Independence Day 2000, a few months after Flora’s very welcome departure, Grant Gerber and his associates organized a volunteer group called the “Jarbidge Shovel Brigade.” Hundreds of people from across the country converged on the remote stretch of road in northern Nevada in order to remove an immense boulder and an earthen berm that the USFS had thoughtfully placed across the disputed road. This was accomplished through muscle power: Three huge ropes were attached to chains that girdled the immense rock, and two hundred men pulled in unison, dragging the stone a distance of 35 feet in two-foot surges. “When they were finished, they not only had defiantly reopened the road, which the U.S. Forest Service closed in 1998, but had symbolically lashed out at federal bureaucrats,” observed the Times report. Gestures of this kind have buttressed Elko County’s entirely commendable reputation for unqualified hostility toward the federal government – and wherever principled troublemakers assembled, Grant Gerber was always one of the ringleaders. The “Grass March Cowboy Express” was inspired by the same muse that prompted creation of the Shovel Brigade. In this instance the proximate grievance was an order issued on July 23 by BLM District Manager Doug Furtado requiring ranchers to remove their cattle from Argenta grazing allotment on Mount Lewis. This was supposedly done in response to incipient drought conditions. However, the cattle were to be relocated – on just a few days’ notice -- from an area where water and forage were abundant, to a drought-stricken flatland. As a “conservation” initiative, that order made no sense. It made perfect sense, however, as part of an ongoing bureaucratic war to extirpate the ranching industry. The Cowboy Express would prove to be Grant Gerber’s last skirmish with the Feds in what for him was a peaceful war of righteous defense. I should acknowledge that Gerber was my wife’s maternal uncle, and that we had some very pronounced disagreements – over the wars in Iraq and Afghanistan, in particular. But I had tremendous respect for someone who had done a great deal to drive one federal commissar out of his county, while driving scores of her comrades into fits of impotent fury. He may – let us hope – enjoy a posthumous victory, if his colleagues succeed in removing Furtado from his current post. To hear or download the most recent Freedom Zealot Podcast, click here. If you can, please help keep Pro Libertate on-line. Thank you so much! Sorry for your family's loss. He sounded like a great man. I know 1st hand about the Feds after doing contracts with the forest service for 30 odd years. I could go on for hours. I sure enjoy your blog!